Jane Hatfield grew up on a family owned and operated dairy farm in central Iowa. Her family raised and showed top quality registered Jerseys. She learned to ride with her sisters at an early age and developed a life-long love for horses. The family dairy moved to southern Iowa in 1980. Horses remained mainly a hobby as the whole family enjoyed riding together for recreation. 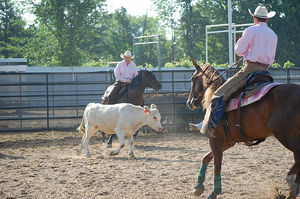 They started raising a few colts, and became interested in reining and cow bred lines. 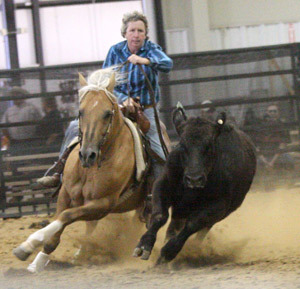 In 2001 Jane and her sister, Judy, purchased Dunnits Gold King as a yearling with plans to start a breeding program with outstanding reining bred paints and quarter horses. As he progressed in early training with their good friend, Larry Wagner, it became obvious that his talents were unlimited. The choice to put him into training & showing with Luke Jones turned out to be a good one. Jane’s first experience with the FQHR was as a very interested spectator and owner of Dunnits Gold King at the 10th Anniversary FQHR Round Up & Review in 2004. There she watched Luke Jones ride the young stallion to five class championships and both the Open High Point and Versatility Championships. The versatility of the foundation quarter horse and the friendly exhibitors and FQHR staff definitely made big impression on Jane and her family. Dunnits Gold King went on to finish 2004 as the 3rd High Point AQHA Jr. Working Cow Horse, 5th High Point AQHA Working Cow Horse (all ages), AQHA World Show performer in Reining & Working Cow Horse, and a winner and money earner in the NRHA. After deciding not to continue his professional showing career, Jane started riding Dunnits Gold King herself. She found that she could learn a lot from him. 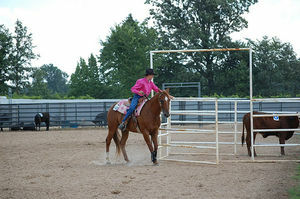 She began showing him in very successfully in Iowa Ranch Horse Association shows, winning all around championships in both amateur & open divisions. She had hopes of returning to the FQHR Round Up & Review. When the FQHR moved its Round Up & Review to Lincoln, NE in 2009, Jane decided to try it herself. She was thrilled to ride Dunnits Gold King to the Amateur High Point Championship and the Reserve Versatility Championship. Once again, the friendly competition and variety of classes made her want to keep coming back. Over the next five years, this has led to one Amateur Versatility Championship, another Reserve Amateur Versatility Championship, and 3 Reserve High Point Amateur Championships, for Jane and Dunnits Gold King. Although Iowa doesn’t have an official FQHR Affiliate, Jane has invited several friends and relatives to compete at the Round Up & Review. She is very proud to not only see Dunnits Gold King return to the 20th Anniversary Round Up & Review as Reserve Champion Stallion, Champion Speed Horse, Champion Show Horse, and Reserve High Point & Versatility Champions… four of his daughters were shown there as well. They were exhibited by Jane, her nephew - Kyle Hatfield, and Cade Vicker. Dunnits Gold King’s offspring have proven very successful in other organizations as well. 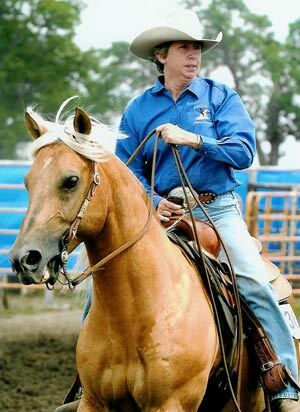 He has performing offspring in four countries with NRHA & NRCHA earnings of $20,000+ and AQHA & APHA World Show performers. Jane has shown his daughter, Dunnits QT Royal, at the APHA World Show where she earned the Reserve World Championship in Amateur Working Cow Horse in 2013. 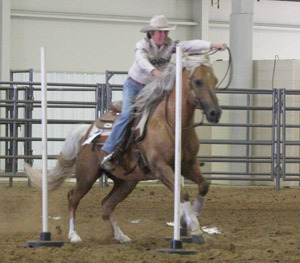 The FQHR Round Up & Review remains one of Jane’s favorite events each year. She looks forward to renewing the friendships that she has built over the years.